John Weber Toward Freedom Banner - SPARCinLA We are SPARC: Art | Community | Education | Social Justice SPARC | Social & Public Art Resource Center | Creating Sites of Public Memory Since 1976 | Founded by Judy Baca, Donna Deitch & Christina Schlesinger | SPARC is a community cultural center that creates public art as a vehicle to promote civic dialogue, foster cross-cultural understanding, and address critical social issues. We accomplish our mission by producing, preserving and presenting community-based public art. SPARC is a facilitator Ð finding ways to tell richly textured stories that help community participants and artists achieve a measure of change and transformation. Please help us show our support for the mural remaining at its original site. You can make a quick call to The Help Group’s VP/Public Affairs, John Farrimond, or contact Councilmember Jack Weiss at District 5 where the mural is located. Please let them know that you support the mural and encourage them to preserve one of many endangered murals in Southern California being lost to building ownership change, tagging, or city policy. John Farrimond can be directly reached at (818) 779-5212. Councilmember Jack Weiss can be reached by phone at (213) 473-7005, by fax at (213) 978-2250 or email at councilmember.weiss@lacity.org. Letters can also be written to Councilmember Weiss at 200 N. Spring Street, Room 440 Los Angeles, CA 90012. 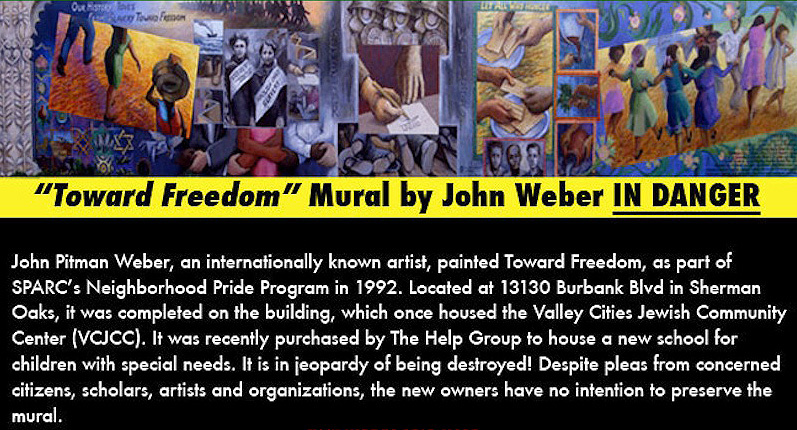 On July 16, 2008 pursuant to the Visual Artist’s Rights Act “VARA” and the California Artist Preservation Act (CAPA) the artist John Weber received 90 day notice of intent to remove the mural. The letter was sent by Mr. John Farrimond, VP of The Help Group. The Help Group’s position is that the mural it is not consistent with their mission and non-sectarian status. Although the artist is willing to work with The Help Group and has shared with them that “the mural is in no way “sectarian” and that I might be willing to modify it, by agreement, to further remove specific symbols which you believe to be “sectarian.” In keeping with SPARC’s 32 year old tradition, the way the mural was originally designed and vetted had deep community involvement and participation. It makes absolutely no sense that this mural would not be appropriate as a teaching and learning tool to all children. Daily News Article: Mural of Jewish exodus could soon be whitewashed – July 25, 2008.